Life ♡. World ☮. And… ☃. 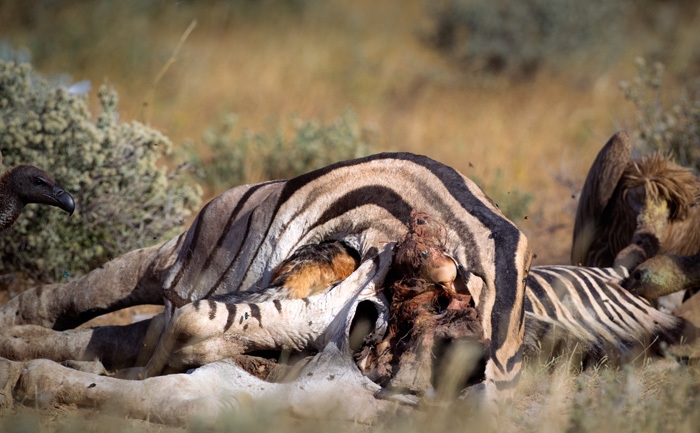 Carcasses like this one litter Etosha’s velds after the summer rains. 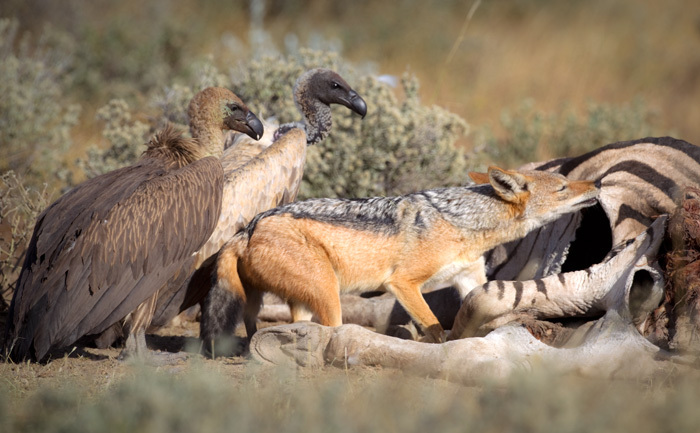 In Etosha’s shortgrass savannas, vultures and jackals behave like eternal enemies that don’t mind dining together. After the end of the summer rains, there are hundreds of dining options laid out for them in the park’s vast velds. 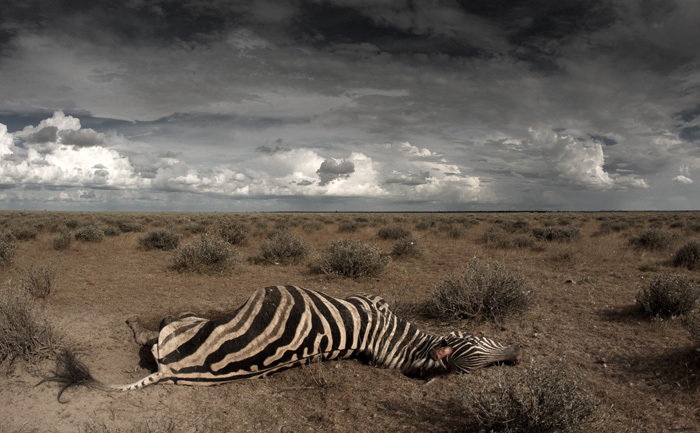 Carcasses of dead zebra, wildebeest, springbok and an occasional elephant are waiting to be scavenged. The killer is a deadly bacterium called Bacillus anthracis, millions of billions of them, that won a battle with the dead animal’s immune system. The season of plenty means that a lot of carcasses are in an advanced stage of decay without even being fully opened up by scavengers, who are perhaps more than satiated by an overkill of carcasses. 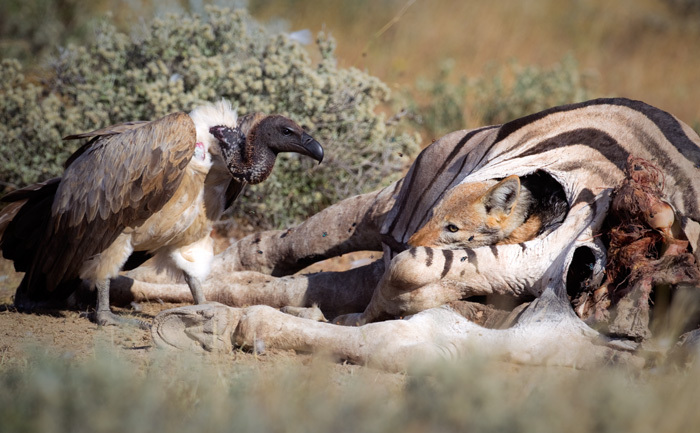 While lions and hyenas may also be on such carcasses, vultures and jackals tend to dominate attendance during the hours of daylight. Their mutual hatred for each other is there for everyone to see, and particularly easy to observe that if the carcasses are close to the roads. 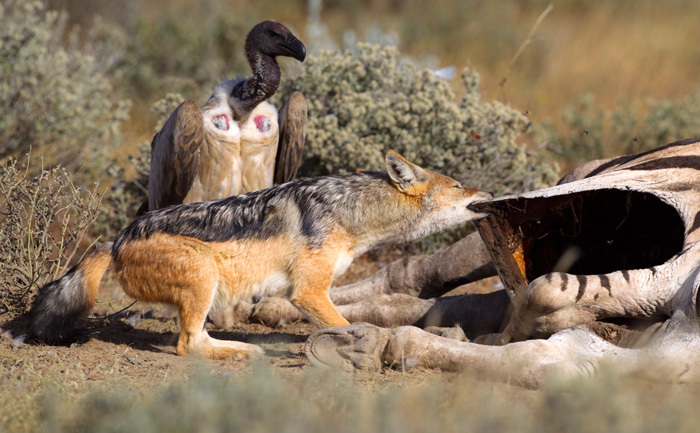 Even a small number of jackals, even a loner sometimes, can keep dozens of vultures away from a carcass they stake claim to. There is plenty for everyone to eat, but sharing is not a virtue that comes naturally to jackals. Even with near-exploding bellies they try every possible thing to chase away the avian scavengers. Vultures, on the other hand, are gifted with immense amounts of patience as that’s the only way they can get a morsel. Vultures maintain a good distance from carcasses that have hungry mammalian predators, sometimes perched on trees. The distance between the vultures and carcasses gets progressively smaller as the belly size of the mammalian predator increases. 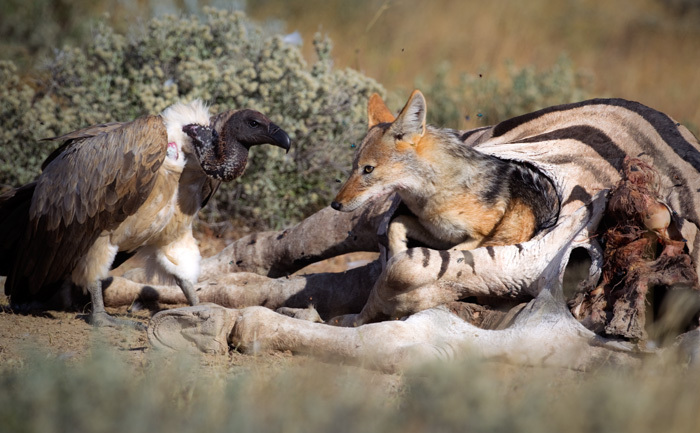 It is easy to observe that jackals’ vigorous defending gets more and more lethargic as the vultures begin to test their mammalian counterparts’ resilience with each passing minute. Jackals are not blessed with the brawn of lions to drag carcasses away into bushes and they are also not blessed with the meat cleaver like jaws that (spotted) hyenas have to break up a carcass. 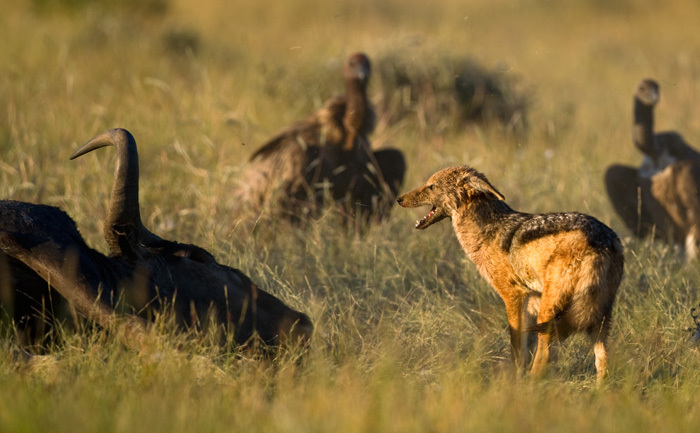 The poor jackals have to threaten daring vultures with dire consequences but they probably have a better chance of catching their own tails than an alert vulture. There’s never a dull moment with jackals around. 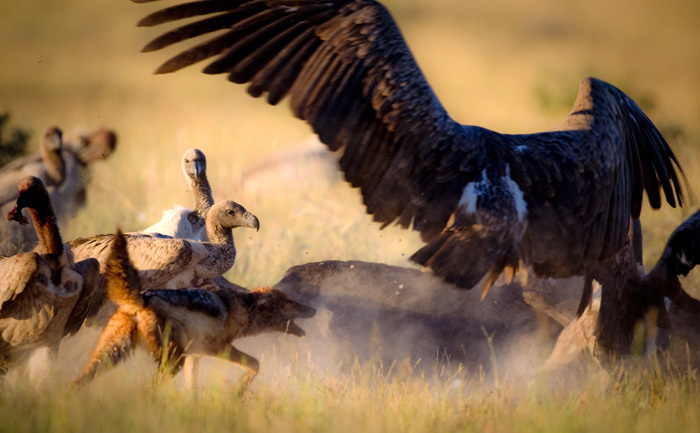 Jackal trying to chase away a vulture. 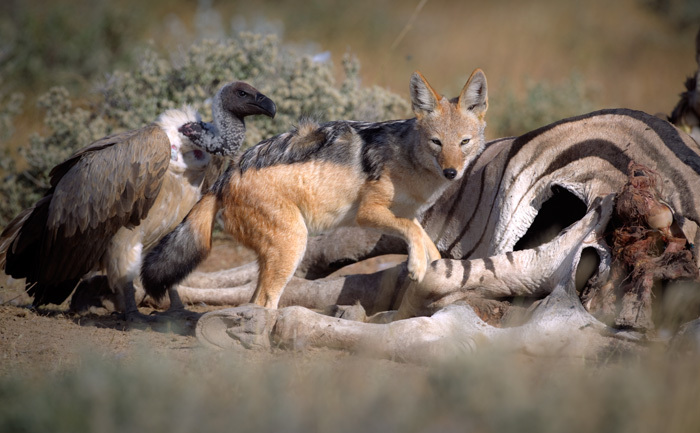 Jackal trying to scare away the vulture. Anyone who’s been out in the veld for long enough will have seen dead zebras that move and shake. If they haven’t heard about such a phenomenon then they will be enthralled like I was. When I pulled up next to a carcass, the vultures were already on it but not actively feeding, and I didn’t think much of it at that time. Nothing unexpected was expected as I stopped to look. As I pulled out my camera and looked to photograph the vultures, I thought I saw the zebra shake! I saw that the zebra’s hind quarters were open and eaten so the zebra was definitely dead. I moved forward to investigate and saw that the zebra had been de-gutted, and a vulture stood at the gaping hole but not venturing any closer to the carcass. Just as I was beginning to think that I may have had a heatstroke or something sinister like that to be thinking about impossible things like moving dead zebras, the zebra shook again! 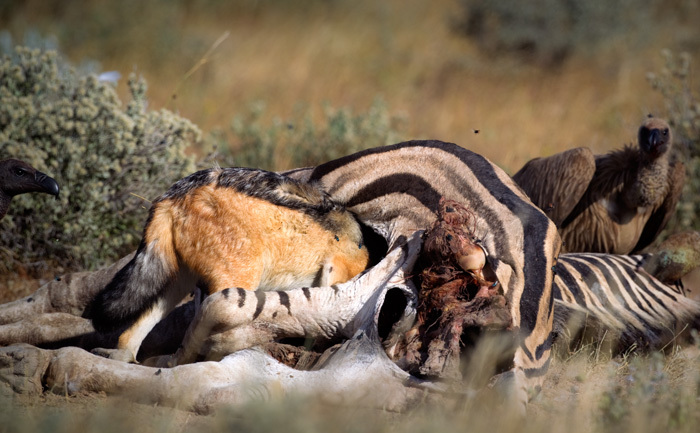 This time, thankfully, I didn’t have to wait long to see the source of the shake as a jackal came out from its feeding frenzy in the dead zebra’s ribcage. The mystery of the shaking zebra was solved. I thought I had seen something rare and uncommon because I had never heard of people talking about it or recalled reading about such a thing. I needed a photograph or no one was going to believe me, I thought. Was the jackal going to do it again? The jackal was not too pleased to see me so close but as a modern human-aware jackal it probably knew that I was no threat. It looked at me and tried feeding from the outside. However, just skin and bones remained in the easily accessible parts and the real good stuff was inside. I didn’t have to wait long for the jackal to make up its mind. A few quick bites of boring skin was enough to force the jackal to look inside. It all happened in a flash as the jackal disappeared into the zebra and the zebra started to vigorously shake once again. However, the jackal perhaps didn’t feel too comfortable feeding blindly, especially with me — an alien — around, so it was out within seconds. In desperation to continue feeding, but in a safe manner, the jackal tried to make a larger opening or pull the zebra apart. Sadly, it didn’t have the powers of its buddies – the hyenas and lions. 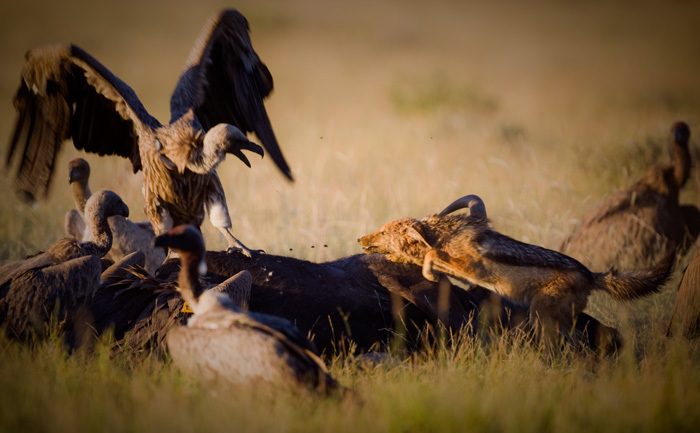 As much as it was entertaining, I had to move on and let the jackal and vultures sort this one out on their own. I was going to announce my discovery and hoped people would be as enthralled as I was. Back in camp, I presented my proud discovery with great excitement. I started with having seen dead zebras shaking, and expected some interesting reactions. “Jackals or vultures,” one of the veterans asked calmly. Nice. I’ll keep an eye out for that. The jackal quickly gets out, perhaps because it felt unsafe? The vulture seems to be interested by the jackal’s behavior! In desperation, the jackal tries pulling away the carcass, or at least widen the hole.